This is a roundup of all the breaking news from around the Las Vegas valley for October 2, 2018. Henderson Police report a carjacking that took place on the 1300 block of Horizon Ridge Parkway, near Stephanie Street, after 2 or 3 individuals approached a car parked behind a business and ended up opening fire, hitting a 17-year-old girl in the leg. The other occupant suffered no injuries. The car was recovered unoccupied and the suspects are still on the loose. The suspicious device was determined to not be a threat and the scene cleared. The lockdown was also lifted at Southwest Career and Technical Academy. 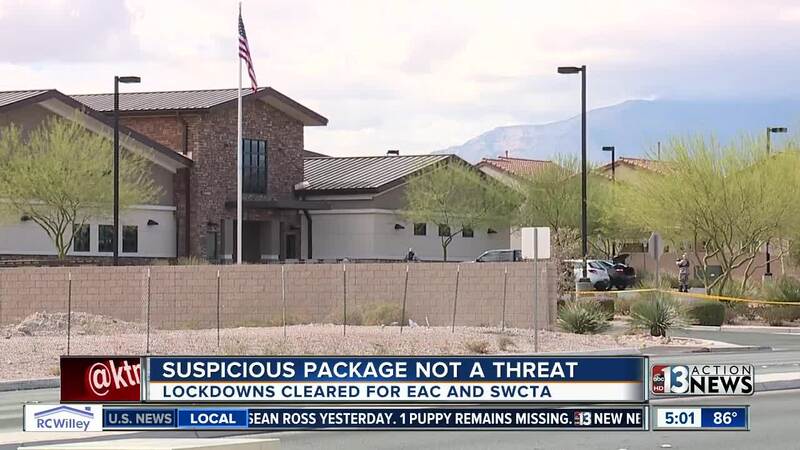 Southwest Career and Technical Academy is on a hard lockdown due to the suspicious package at the Enterprise Area Command. The Enterprise Area Command building for Las Vegas Metropolitan Police has been evacuated because of a suspicious package. The ARMOR Unit has been requested. The package was reported shortly before 11 a.m. The command center is located on West Windmill near Rainbow Boulevard. Police say that 3 people claim they were sleeping in a car near Spencer Street and Warm Springs after smoking marijuana when a car pulled up and some one with a gun got out of the car. A homeowner in the area called police after one of the people in the car knocked on his door. It is not known at this time if an actual crime was committed. Police say that a woman who parked her car on the 2nd floor of the garage at Premium Outlet Mall North was robbed on Tuesday morning. It happened shortly after 6 a.m. The thief was able to get away with her cell phone and purse. No one has been arrested at this time.